I’m officially aboard the smoothie express. Smoothies are all the rage at work, where on any given morning you’ll see no shortage of Nutribullet® or other to-go cups filled with smoothies in a vibrant array of colors. And why not? It’s an easy and yummy way to maximize your daily veggie intake. I became reacquainted with my blender a few months ago when my son started solid foods. No one would ever confuse me for a chef—my husband is the food guru of the family; however, I looked forward to introducing my son to the different flavors of vegetables. My husband and I are primarily vegetarians; while we eat fish, we don’t consume other meat. We want to pass our love of vegetables on to our son—we want him to keep eating his veggies as he gets older instead of turning his nose at them. 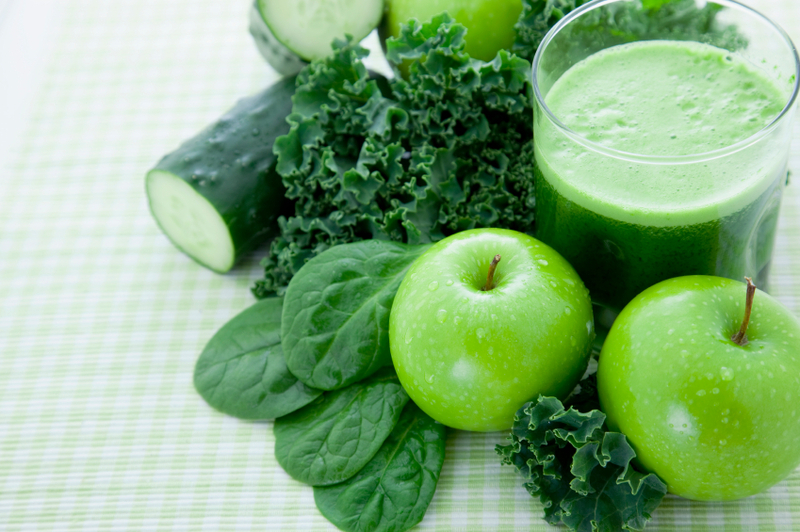 Kale, spinach, cucumbers and an apple make for a delicious smoothie. Smoothies may not be for everyone, and I’m certainly not advocating that it’s the only thing you eat all day. However, a yummy, veggie-rich smoothie for breakfast (or in lieu of sipping coffee or soda on your morning commute), can be a great healthy way to start your day. 1. Stick to a handful of ingredients. When I first started making the smoothies, I went a bit overboard on ingredients, which created a super thick concoction. Instead, choose a green veggie or two and add a fruit and a spice, nuts or perhaps some yogurt or milk—my favorite smoothie so far had spinach, kale, parsley, ginger, blackberries and a banana. And if you do load the blender up with lots of ingredients, also use lots of water to dilute it. 2. If you hate the taste of vegetables, ease into it. Your first smoothies may contain a green like spinach or kale with a cucumber, a banana, an apple and some grapes, for example. Since many of us love the sweet stuff, you may need to ease into the earthy taste of veggies. After a few days, start adding more greens and using less fruit. 4. Support your local farmer’s market or farm stand. Produce farmed locally is often fresher than what’s found in the store because it hasn’t been schlepped across a long distance. Even better, sign up for a CSA (community supported agriculture) program at a farm near you and receive a box of fresh, seasonal, locally-grown produce every week or two. 5. If your mornings are hectic, make the smoothies at night and store them in a glass or ceramic container in the fridge. That way, you just have to grab it and go on your way out the door in the morning. Check out Whole Living or Unconventional Kitchen for some great smoothie recipes and ideas.